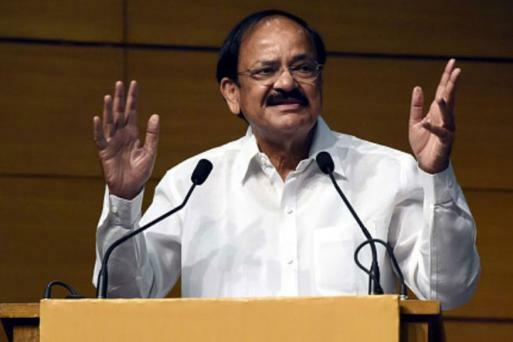 NDA’s nominee Venkaiah Naidu was on Saturday elected as the Vice-President of India. Naidu defeated Gopalkrishna Gandhi, the Opposition’s candidate. Naidu got 516 votes, while Gandhi secured 244 votes. Around 98.21% polling was recorded in the V-P elections. Last month, Ramnath Kovind became the first BJP leader to win presidential poll defeating opposition's Meira Kumar. Naidu will be the second BJP leader to become vice- president after Bhairon Singh Shekhawat (2002-2007). Union Law Minister Ravishankar Prasad: Venkaiah Naidu understands the values of this country and its politics. It is a great day for India’s democracy. He is a leader of eminence and will uphold our Constitution. Gopalkrishna Gandhi thanked all the MPs who voted for him. “They voted for free speech and pluralism,” he said. Gandhi congratulated Venkaiah Naidu and said he will be the Vice-President of all of India. I congratulate M Venkaiah Naidu on his victory. The election saw two victories - one of Naidu, another of free speech; the second victory belongs to all the people of India, Gopalkrishna Gandhi said. All the Opposition parties had thought through before zeroing into Gopalkrishna Gandhi as a candidate. This election was about ideology, and one shouldn't compromise on ideology, senior Congress leader Gulam Nabi Azad said on Saturday. Congratulations to @MVenkaiahNaidu Garu on being elected India’s Vice President. My best wishes for a fruitful & motivating tenure. "I will seek to utilise the vice presidential institution to strengthen the hands of the president and uphold the dignity of the Upper House," Naidu said after winning. I am very humbled. I am also thankful to the Prime Minister and all party leaders for their support," said India's vice president-elect V Naidu. Starting as a student leader, Venkaiah Naidu's rise to become the 15th vice president of India is a culmination of 46 years long political journey. Minister of State PMO Jitendra Singh said that Indian politics is taking a new turn. "He is the best choice, a fair person, and a pan-India personality. The Opposition candidate, Gopalkrishna Gandhi, congratulates his opponent and winner M Venkaiah Naidu. GVL Narsimha Rao, the BJP spokesperson, congratulated Venkaiah Naidu on becoming the new vice president of the country. Election Officer Shemsher K Sharif on Saturday evening announced the name of the newly elected vice president of India. With 516 votes, NDA candidate M Venkaiah Naidu was elected the 15th vice president of India. The Opposition candidate, Gopalkrishna Gandhi, secured 244 votes. Fourteen eligible Members of Parliament didn't cast their votes. Of the 14 eligible MPs who didn't cast vote today, BJP 2, INC 2, IUML 2, TMC 4, NCP 1, PMK 1, Independent 2. Voting for the vice presidential election ended Saturday evening with 98.21 per cent of members of Parliament exercising their franchise. Assistant returning officer Mukul Pandey said at the closing of the voting process, 771 out of 785 MPs had cast their vote. The counting will begin at 6 pm and the result would be out by 7.15 pm. Two BJP leaders -- Sanwarlal Jat and Vijay Goel -- are hospitalised and could not vote, BJP leaders said. The NDA's M Venkaiah Naidu is pitted against opposition candidate Gopal Krishna Gandhi. Cricket legend Sachin Tendulkar and actor Rekha, often criticised for their low attendance in the Rajya Sabha, on Saturday cast their votes in the vice-presidential poll. The two nominated MPs of the Upper House were accompanied to the voting room by Congress' Rajya Sabha MP Rajeev Shukla. Dressed in an elegant cream saree, Rekha arrived around 11.15 am and after casting her vote, she had a brief chat with Dimple Yadav, Lok Sabha MP and wife of Samajwadi Party president Akhilesh Yadav. 98.21 per cent polling in vice presidential elections. Counting to commence at 6: Assistant Returning Officer Mukul Pandey. 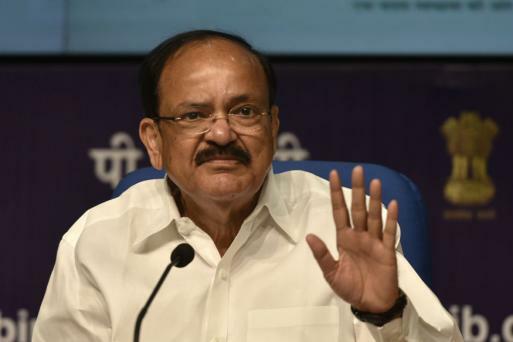 NDA's nominee Venkaiah Naidu on Saturday said he is now a "non-party man" and exuded confidence in getting support from Members of Parliament (MPs) casting their vote to elect the Vice-President of the country. "There is no my party or your party. Now I am a non-party man. A majority of political parties in India are supporting my candidature. I am confident that they will all vote in the election," he told reporters. Naidu said he is known to all his MPs in both Lok Sabha and Rajya Sabha. 96.94% polling till 3 pm in Vice Presidential elections: Assistant Returning Officer Mukul Pandey. According to Mukul Pandey, the assistant returning officer of the vice presidential polls, 713 of 785 electors had voted by 1 pm, recording 90.83% voting. The queues started in the morning itself. 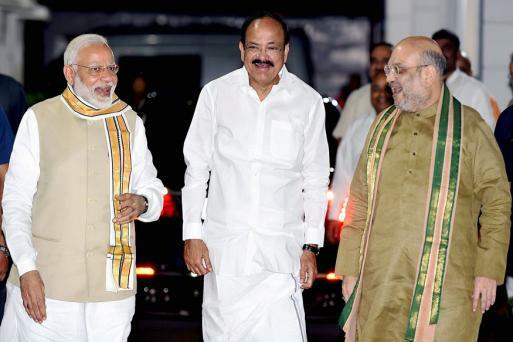 Prime Minister Narendra Modi and M Venkaiah Naidu, the NDA's Vice Presidential nominee and a Rajya Sabha member, as well as Uttar Pradesh Chief Minister Adityanath, a Lok Sabha member, were among the first to cast their ballot. The prime minister was standing in queue before the voting hall opened at 10 am. Congress vice president Rahul Gandhi, his party MPs Jyotiraditya Scindia, Deepender Singh Hooda and Sushmita Dev also voted to elect the next vice president. 90.83% voting till 1 pm in Vice Presidential elections: Assistant Returning Officer Mukul Pandey. "Not only here but wherever voting takes place, every citizen should vote," says Rajya Sabha MP, Sachin Tendulkar after casting his vote. New Delhi: The race for NDA's vice-president pick went down to the wire. Maharashtra governor Vidyasagar Rao was a strong contender till the end. "This election is not just about numbers, it is also about values," says Gopalkrishna Gandhi. Venkaiah Naidu holds the numerical edge over opposition candidate Gopalkrishna Gandhi in vice-presidential elections on Saturday. "I think we will miss him (Venkaiah Naidu) in one place, but you will see more action in another place," says Manohar Parrikar.